Numbers 1,2,3 have an additional rule, they are also chess queens. If all others numbers removed, the 1s do not attack each other horizontally, vertically or diagonally. Same rules as number 1 also apply to numbers 2 and 3. There is only 1 unique solution. I managed to first place all threes. From there, I could place all the ones. 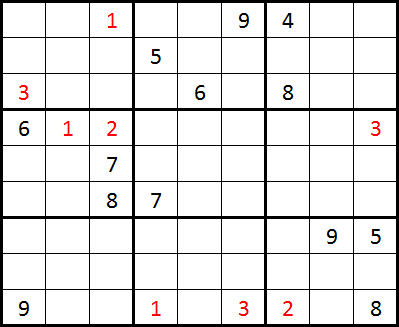 Adding the middle left 9, central 6 and top right 5 using sudoku rules, I could place all twos. Then, all that was left was a regular sudoku. Not the answer you're looking for? Browse other questions tagged logical-deduction chess grid-deduction sudoku or ask your own question.